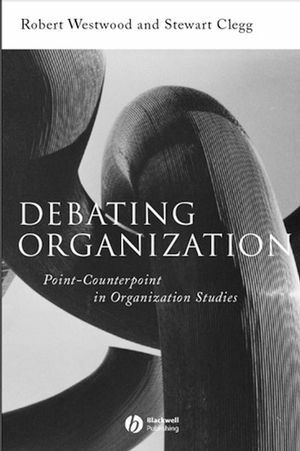 This volume introduces readers to the central debates of organization studies through a series of 'point' and 'counterpoint' debates by major figures in the field. Introduces readers to the central tensions and debates of organization studies. Celebrates the productive heterogeneity of the field by placing competing perspectives side by side. Includes contributions from major figures in the field. Structured in an innovative 'point' and 'counterpoint' format. Robert Westwood is Reader/Associate Professor at the University of Queensland Business School. He is the co-editor of The Language of Organization (2001), Hong Kong Management and Labour: Continuity and Change (1999) and the editor of Organizational Behaviour: Southeast Asian Perspectives (1992). Westwood is also an associate editor of the journal Culture and Organisation and on the editorial board of Organization Studies. Stewart Clegg is Professor of Management at the University of Technology, Sydney. He is the author or editor of many books, including Frameworks of Power (1989), Modern Organizations (1990) and the Handbook of Organization Studies (1996), which won the George R. Terry Book Award of the American Academy of Management for 'most outstanding contribution to management knowledge' in 1997. 1. The Discourse of Organization Studies: Dissensus, Politics and Paradigms: R. Westwood and S. Clegg. 2. Organization Studies: a Discipline or Field?. Commentary: What Kind of Science Should OS Strive to Be?. From Fields to Science: Can Organization Studies Make the Transition? Bill McKelvey, University of California Los Angeles. Paradigm Plurality: Exploring Past, Present and Future Trends: Mihaela Kelemen, Keele University, and John Hassard, UMIST. Order is Free: On the Ontological Status of Organizations: Kimberly B. Boal,Texas Tech University, James G. Hunt, Texas Tech University, and Stephen J. Jaros, Southern University. Ontology: Organizations as World-Making: Robert Chia, University of Exeter. Commentary: On Being Positive and Becoming Constructivist. Position Statement for Positivism: Lex Donaldson, University of New South Wales. Social Constructionism and Organization Studies: Barbara Czarniawska, Göteburg University. Commentary: Ironic Authenticity and Paradoxical Constructivism. From Subjectivity to Objectivity: A Constructivist Account of Objectivity in Organization Theory: William McKinley, Southern Illinois University at Carbondale. From Objectivity to Subjectivity. Confession of a Counter-Modernist: Pursuing Subjective Authenticity in Organizational Research: Peter Case, Oxford Brookes University. Enacting an Environment: The Infrastructure of Organizing: Karl E. Weick, University of Michigan. Enactment as an Institutional Change Mechanism: P. Devereaux Jennings, University of British Columbia, and Royston Greenwood, University of Alberta. Commentary: The Dynamics of Institution. The Problem of Order Revisited: Towards a More Critical Institutional Perspective: Michael Lounsbury, Cornell University. Power, Discourse and Institutions: Institutional Theory and the Challenge of Critical Discourse Analysis: Nelson Phillips, University of Cambridge. Commentary: The Politics of Inclusion and Exclusion in Globalization. The Disorganization of Inclusion: Globalization as Process: Barbara Parker, Seattle University. Globalization and the Organizations of Exclusion in Advanced Capitalism: Marc T. Jones, Macquarie University. Part III: Structure and Culture:. Structure: Bob Hinings, University of Alberta. Disorganization: Rolland Munro, Keele University. Commentary: Making Sense of Culture. The Case for Culture: Neal M. Ashkanasy, The University of Queensland. Instantiative vs Entitiative Culture: The Case for Culture as Process: Andrew Chan, City University of Hong Kong. Part IV: Identity and Relationships:. Theorizing Gender and Organizing: Silvia Gherardi,Trento University, Judi Marshall, University of Bath, Albert J. Mills, St Mary's University. Commentary: Trust Organizational Psychosis Versus the Virtues of Trust. The Virtues of Prudent Trust: Roderick M. Kramer, Stanford University. Fool'd with Hope, Men Favour the Deceit or: Can We Trust in Trust? Burkard Sievers, Bergische Universität Wuppertal. 13. Question Time: Notes on Altercation Stephen Linstead.